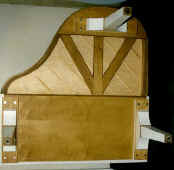 You will find the construction of our piano shells to be the best in the industry. Our 50,000 square foot factory in the San Francisco bay area boasts a 100 ton press and CNC 4 head routing machine. Each piano is hand crafted with the emphasis on duplicating the exact look of a standard grand piano with a more durable laminate finish and up to 1/4 the weight. All of our pianos, unless otherwise requested, include the ribbed facade of a typical soundboard. These photos provide general views and several different angles to show our concern for detail on our pianos. Our stock colors are satin (matte) black or white. Our newest color, quarry black and white are quickly becoming the most popular color options. Polished white, copper and aluminum metal, polished black, sparkle black, red, woodgrain, marble, mirror, and 500+ custom colors are available. "Mirror Image" (left handed) pianos are exclusively built through Slam Grand Piano Company.